It’s Fall and that means it’s busy here at Amphora. Grapes are pouring in, wine club shipments are being packed and friends, old and new, are walking through the tasting room door. Just before harvest began in earnest, Rick and Jim paid a visit to one of Jim’s oldest friends who was busy preparing for the adventure of a lifetime. Randall was just days away from setting sail on his second attempt to single-handedly circumnavigate both the American and Antarctic continents in one season. 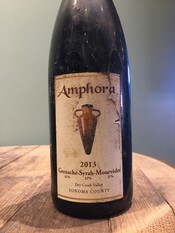 Randall had something for Rick and Jim at that meeting, a bottle of Amphora's 2013 GSM that had travelled 26,000 miles on his first attempt. That’s one well-travelled bottle of wine! If you’d like more information on Randall and his epic adventure, his website (www.figure8voyage.com) has much more information, including a daily blog which is a must read. 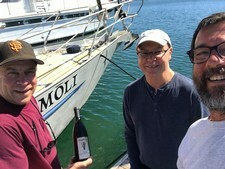 Here is a portion of his blog from just a few days ago (FYI, “Mo” is his boat). Now on to a few notes from this year’s harvest. So far, Amphora has crushed Barbera, Tempranillo, Grenache, Cabernet Sauvignon, Cabernet Franc, Syrah, Tannat, Rosé of Grenache and Petite Sirah with more to come. After weighing, crushing and de-stemming the grapes, the wait for fermentation to occur begins. For this first step (fermentation) we use both one-top open top fermenters and our 800L and 1000L terracotta amphorae. The soon-to-be wine needs constant attention during this crucial period. In addition to monitoring the temperature of the grapes, three times a day what looks like a potato masher made for Paul Bunyan, is used to “punch-down” the cap of solid matter made up of the grape skins, seeds, stems and pulp that rise to the surface. This is done to integrate the cap back into the wine. Think of the cap like a tea bag—if it’s just sitting there floating on top, you’re not going to get the color or flavor that you want in your tea, and we all know that Rick’s wines are big on color and flavor. 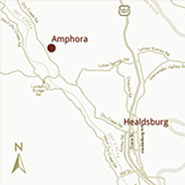 Unlike larger wineries where this punch-down is done by machine, here at Amphora it’s all done manually. This picture can give you some sense of scale, Amy is 5’ tall. We’re excited about this year’s harvest so far and are looking forward to what’s still to come. That's all for now. Cheers from all of us here at Amphora!